The European Union is working with Libyan coastguards to reduce the number of migrants crossing the Mediterranean Sea. But many of those intercepted end up in detention centres in Libya, where some migrants say they are used as slaves, as the BBC's Stephanie Hegarty found when she spoke to some Nigerians who have just returned home. As evening falls on Benin City, outside the mildewed 1960s block of one of the city's many hotels, a group of men and women are sitting on a scattering of plastic chairs, under a sign advertising "exotic cocktails" and "groovy nights". But they are not here for drinks or dancing, they are about to start the hard work of rebuilding their lives. They have come from Libya, where most of them were held in detention centres by the Libyan authorities. And they have returned with accounts of horrifying abuse, including being leased or sold as slaves. Agen Akhere has a round, baby-face but his small eyes are searing red. He is sniffling as he talks, and looks like he might well up with tears. He was held for two months in a detention centre in a place called Gharyan. He was registered by the UN's migration agency (IOM), released from the detention centre and flown home - but his friend did not make it. "It's because of money," he said, pleading and craning his neck to get closer to the microphone. "My friend, he's still there. His name is Samson. He's still there, in Gharyan." Again and again they tell the same story, of detainees horrifically abused by prison guards, starved, beaten, raped - and traded as slaves. "They come to our caravans [cells], they pick six persons to do their dirty jobs to do farming, brick-laying work," says Lucky Akhanene. He returned in the same group as Mr Akhere and was held in Gharyan for four months. "They give us out to their friends. They don't pay us. It's just hard labour, if you're not fast with your job you get beaten." Jackson Uwumarogie and Felix Efe were arrested "on top of the sea", off the coast of Libya and taken to Gharyan. Mr Uwumarogie overheard the men talking about a price - 1,000 dinars ($735; £550). They were put into a van and taken to a farm. Mr Uwumarogie and Mr Efe were forced to work harvesting onions and feeding cattle. They slept in a plywood hut and were guarded day and night by men with guns. They were never paid. Mr Uwumarogie's baggy tracksuit bottoms hang from his tiny waist and a tight woollen polo neck highlights his skinny frame and slightly puffy, swollen cheeks. He is clearly not well. On the farm they were only given food every few days, he said, and sometimes given sea water to drink. After six months they and five others were loaded into a pick-up truck and taken to the desert. "They dumped us there," Mr Uwumarogie said. They were there for two days. "It was with the help of God that we found the man that rescued us." The man brought them to his house and then took them to Tripoli to meet the IOM. Stories of black slavery in Libya have been circulating for the past two years. But the number of accounts we heard from recent returnees seems to suggest it has become endemic in the detention system. And it is tied to something that has been going on for much longer: a dark but thriving industry in which migrants are extorted for money by traffickers and prison guards. "There was a connection man who normally has a connection to the Mudeen, that is director of the prison. He would call them and he would bail them out," Mac Agheyere said. He left for Europe in 2015 and was arrested and taken to prison in the Libyan town of Zawiya. "I had no-one to bail me out." He explained that the middleman would charge up to 250,000 naira ($695; £520) per person. Mr Aghayere borrowed money from his family in Nigeria to pay for his own release but he was arrested again. This time he could not afford to pay but one day a man came, who paid it for him. "I thought he was my Messiah," Mr Aghayere said. "I never knew he was an evil person." The man owned a carwash and some beach huts by the sea. He said Mr Aghayere should work for a month to pay back the release money. "He beat me with an iron bar," he says. "They took barbed wire and tied my hands and my feet and threw me inside a car and took me back to prison." 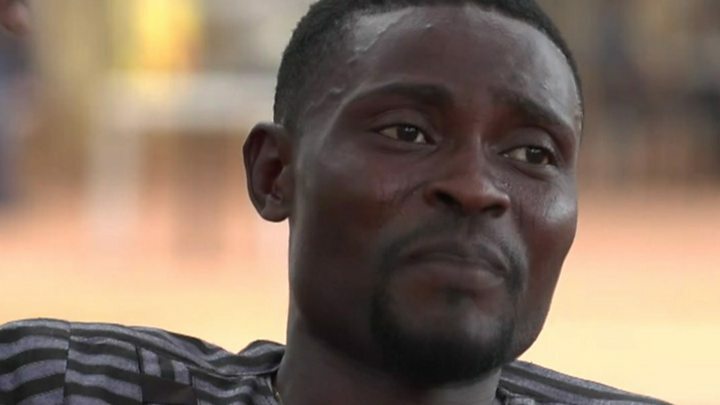 Mr Aghayere was told he was being sent back to Nigeria but he was transferred to Gharyan prison and spent seven months there before he was repatriated by the IOM. He said in the time he was there he saw 20 people die. Each of the Nigerian migrants we met, separately, told us that they were given very little food - a piece of bread smaller than the palm of their hand in the morning and watery pasta in the evening. Some said they drank water from the toilet. They were regularly rounded up and beaten. "They beat boys," Fatima Atewe said. She was one of the only women who agreed to speak to us about what happened in Gharyan. "Even in prison in Nigeria, they don't beat Nigerian people the way they beat Nigerian people there." "Many people are dying there day and night. And their cold is not good, their cold is like inside a fridge," Ms Atewe added. The UN's migration agency, together with various African governments are working to get migrants home. But delegates from each country have to get to the detention centres before they can identify their citizens. Libya is in the middle of a civil war. With many different militia groups vying for power, travelling beyond Tripoli is dangerous. The prison at Gharyan is run by Libya's Ministry of Interior which itself is run by two militia groups. The Ministry of the Interior is only nominally under the UN-recognised government in Tripoli. As of yet, the Libyan Interior Ministry hasn't responded to requests for an interview. Arrivals to Italy have fallen by 70%. But many of the migrants who are stopped end up in detention centres like Gharyan. Medical charity Medecins Sans Frontieres says the numbers of migrants in the Libyan detention centres that it has access to have increased tenfold since July, when these policies began. The UN's human rights chief Zeid Ra'ad Hussein has described the policy as "inhumane". As more and more migrants pile into these centres, conditions will only get worse. The stories of abuse will keep coming. Those that return come with a warning. "I just want to plead with everyone out there," Lucky Akhanene said. "Libya is not a place to go. "Most times I wonder if Libya is not from this earth."